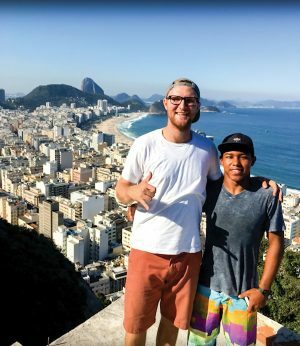 Ascending Rio de Janeiro mountain in a rickety cable car, BYU international business student Bryce R. Hawkey (’17) and other community-outreach interns for the International Olympic Committee (IOC) discussed their project for the week: building the Cantagalo-Pavão-Pavãozinho favela neighborhood’s first playground. As they disembarked, they emerged into disorder: brick and tin houses stacked precariously, mounds of trash, and encroaching jungle foliage that flourishes in the favela, as does drug trafficking and violence. After winding through a labyrinth of shoulder-width alleyways for several minutes, the team found their workspace—a small plot of land cleared and ready for rejuvenation. Bryce Hawkey (left). Photo courtesy Bryce Hawkey. Over the next four days, eager interns and favela residents labored through the muggy weather to dig holes for wooden posts, build jungle gyms out of tires, and install a stone barbecue for families to enjoy. Barefoot local children helped paint the cement steps that lead to the playground, adding brightly colored flowers and suns to the walkway. A local graffiti artist, commissioned by the outreach program, added touches to a mural promoting unity. Hawkey says that for the humble residents of the favela, this is more than just a playground. It is a safe place for their children to thrive in the community, a place where they can forget their struggles and just be kids. It’s a symbol of hope that more opportunity will come. An Idaho farm boy, who speaks Arabic and worked with refugees on his mission, was in the right place at the right time.